Regardless of the weather in the Lower 48 (winter ice storms, too-crisp spring mornings, the dark shiver of late autumn), it's always summer on Mexico's Costa Grande. This spectacular 200-mile stretch of beach lining the Pacific Ocean can even offer respite during the dog days of August, with its slow-paced vibe, white-sand beaches, aquatic distractions, and indulgences like yoga and massage (to say nothing of the margaritas). Writer Karen Kefauver headed down south to check things out, hanging out in Zihuatanejo, daytripping to Barra de Potosi and Troncones, and plotting a few overnight excursions to get acquainted with these laid-back towns. She breaks down the scene below, and offers visual evidence in her photo gallery of Costa Grande's assured perfection. Located in the Mexican state of Guerrero, Zihuatanejo is less well known than the tourist hubs of Puerto Vallarta to the north and Acapulco to the south. With more than 62,000 residents, Zihuatanejo has outgrown its reputation as a sleepy fishing village. Yet Zihua, as it is known, retains a friendly, small-town feel despite the bustle of modern commerce. At open-air markets that stretch for blocks, visitors shop for silver, leather, ceramic, and woven handicrafts imported from mountain villages. The city's star attraction is the beach and swimming at Zihuatanejo Bay. For a quick meal, there are dozens of outdoor taco bars. Or for a special dinner, pick one of several five-star restaurants in the city. Just five miles away is Ixtapa, a pristine luxury resort with lush beaches, a nature preserve, and active nightlife. Both Ixtapa and Zihuatanejo have numerous hotels and condos with prices to suit all budgets. To experience a slower pace of life than Zihua, head nine miles south to Barra de Potosí, a fishing hamlet of 500 residents. Kids play barefoot in the dusty street, and fishermen repair their homemade nets. Take your time strolling through the town, visiting small convenience shops operated from homes. Beyond the town's palm tree grove sprawls a lovely stretch of beach. At the beach's south end, Laguna de Potosí is an ideal spot to watch waterfowl or rent a kayak on your own or with a guide. A ten-minute walk from the town center, the white-sand beach serves as a local soccer field and a great spot to take an ocean swim. For lunch, pick a table on the beach at one of the palapas, a thatch-roofed restaurant. At La Condesa, savor the catch of the day and warm, handmade tortillas along with a coconut cocktail—or sip the juice right from the coconut. Afterwards, roll into the hammock next to your table. A transplanted Californian, Laura Kelly, owner of the bed and breakfast Casa del Encanto, will warmly welcome you to her homey, open-air lodging. Featuring brightly painted rooms and a spacious courtyard for leisurely morning breakfasts, the wonderful lodging lives up to its name, "House of Enchantment." As an active member of the local community, Laura can suggest the best places to eat and visit. For a mini road trip, head south to the town of Juluchuca. From there, ask for directions to the La Tortuga Feliz. Run by locals in conjunction with the new eco-resort Playa Viva (slated to open in '09), the sanctuary protects the native green and leatherback turtles. Visitors can also arrange to release baby turtles into the ocean. An hour's drive north from Zihuatanejo, Troncones offers readily available massage and yoga options at a wide variety of accommodations. Down a long unpaved road that parallels the water, there are a dozen lodgings—bed and breakfasts, hotels, and retreat centers. Many are owned by transplanted North American residents who love the area's peace and quiet. At one end of the road lies the small town of Troncones. At the other is the even smaller community of Majahua, which has an amazing stretch of undeveloped beach popular with surfers and swimmers alike. 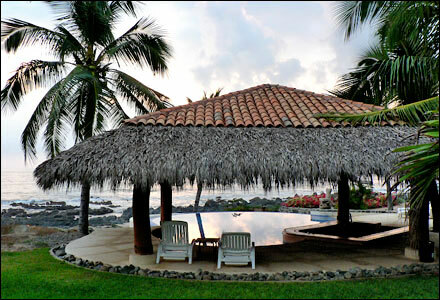 One of Troncones's most popular hotels is Hacienda Eden on Manzanillo Bay, offering some of the area's best spots for surfing, boogie boarding, and swimming. Eden also has a stellar restaurant on a patio near the beach. Directly in front of Eden is the safest spot for swimming, along with a nearby surf break. Another appealing lodging, a five-minute walk from Eden, is Casa Manzanillo, a hotel with a beautiful infinity pool overlooking the beach. In the evening, the hotel's restaurant, Diego's, comes alive with salsa dancing and a fantastic menu featuring local dishes. Freelance writer Karen Kefauver, based in Santa Cruz, California, writes about adventure travel and endurance sports.